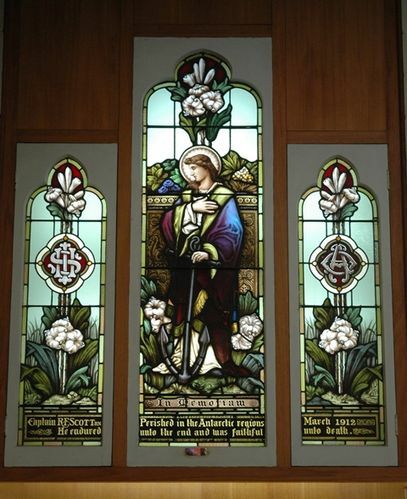 A stained glass window commemorates Robert Falcon Scott who died attempting to be the first person to reach the South Pole. Scott was a Royal Navy officer who was noticed by the Royal Geographical Society, which appointed him to command the National Antarctic Expedition of 1901-1904. The expedition - which included Ernest Shackleton - reached further south than anyone before them and Scott returned to Britain a national hero. He had caught the exploring bug and began to plan an expedition to be the first to reach the South Pole. He spent years raising funds for the trip. On 17 January, they reached the pole, only to find that a Norwegian party led by Roald Amundsen, had beaten them there. They started the 1,500 kilometre journey back. Evans died in mid-February. By March, Oates was suffering from severe frostbite and, knowing he was holding back his companions, walked out into the freezing conditions never to be seen again. The remaining three men died of starvation and exposure in their tent on 29 March 1912. They were in fact only 20 kilometres from a pre-arranged supply depot. In connection with the lecture on Antarctic exploration given on Saturday night before members ot the Royal Society by Admiral Evans, himself a member of the famous Scott expedition, it is of interest to recall that Tasmania possesses its own Scott memorial. The Anglican Church ot St. Alban's, Claremont, is both beautified and distinguished by its altar window commemorative of Scott's heroism. The memorial is composed of three panels, the central one dominated by the symbolic figure of duty and courage, supporting and supported by the anchor of confidence and hope. Lilies of hope complete the central panel, and are prominent in the panels to right and left. The memorial bears the inscription, "Captain R. F. Scott perished in the Antarctic regions March, 1912. He endured unto the end, and was faithful unto death." The gift to the church of Mrs. J. C. E. Knight, the memorial was dedicated in 1915, Lady Macartney (wife of Sir Ellison Macartney), then Governor of Tasmania, a sister of Captain Scott, being present at the dedication ceremony. To Lady Macartney, as also to Mrs. Scott, the mother of the explorer, photographic reproductions of the memorial, tinted in the exact tones of the stained glass itself, were subsequently given in response to their request. Admiral Evans has requested, and has received, a reproduction of the memorial. The Mercury (Hobart), 31 March 1930.